Title: My Little Sister is Among Them! Description: The story centers around Mikadono Shōgo, the son of an industrial magnate named Mikadono Kumagorō who passed away. As a final wish, Kumagorō gave Shōgo a condition before Shōgo can inherit the family legacy — find a female mate at school. Shōgo transfers into a school to fulfill that condition. However, he learns that he has a younger sister who was separated at birth. He does not know what his long-lost sister looks like, but she happens to be one of the students at his new school. All chapters available for My Little Sister is Among Them! 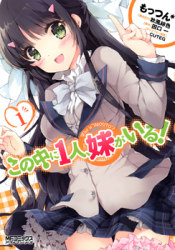 Vol.1 Section 4: My Classmate Became My Little Sister? Vol.1 Section 3: Just Who is My Younger Sister? !